Owners, directors, administrators, educators and families of Long Day Care, Out of School Hours Care (OSHC) and Family Day Care Services within Australia. 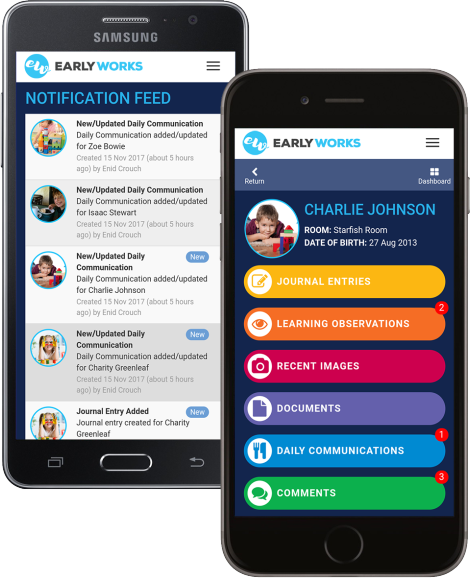 EarlyWorks is an Australian based, comprehensive early childhood programming, documentation, portfolio and family communication system. Features include planning, observations, program generation,daily or weekly journals, photo and document sharing, child files & portfolios, alerts and notifications, daily communications (meals, nappies sleep, etc), tasks & events,reflections of pedogogy, QIP generation, family engagement, outcome assessment using EYLF, MTOP or custom frameworks and more. Pros: It covers all aspects of programming required of our Early years educators, it sets up reminders so that no aspect is forgotten. Cons: Haven't found much I don't like yet with the system. maybe an online manual for those like me that have to train new staff in the use of it so that i don't forget parts.